Oran Kearney has praised the medical staff who attended Eoin Bradley following his horror injury on Saturday. The Coleraine striker collided with the post after only two minutes of the game against Portadown. The 33-year-old was in a lot of distress and received treatment on the pitch at The Showgrounds for almost 20 minutes. Initial fears were that Bradley had hurt his back in the accidental collision, but these were allayed on Saturday evening as the club confirmed the front man had been diagnosed with broken ribs and a punctured lung at the Causeway Hospital. Bradley is now facing several weeks on the sidelines, but Kearney, like everyone who witnessed the incident, was pleased it wasn’t more serious. “With the way he collided with the post we feared the worst, and you have to take every precaution,” said Kearney. “That’s why it was right to make the decision not to move him until the right people were there to make that call. “Now-a-days we have so many good medical people about the ground Eoin was able to get excellent treatment as soon as it happened. “He was complaining at the time about his ability to breathe and pain in his ribs. It was only Bradley’s third game for the Bannsiders since his return to the club from Glenavon. He scored a hat-trick in the cup against Carrick Rangers last Saturday, and he was unlucky not to score before his injury in the league game at the weekend. 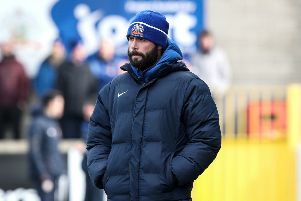 “Yeah Eoin got himself in a great position just after Portadown had taken the lead, he was unlucky not to finish the chance, unfortunately his momentum carried him into the post,” said Kearney. “I’m surprised the post is still standing to be fair he hit it very hard. “It’s terrible luck for him as he has had such a big impact here since his return. “In the two games he has played asince coming back against Linfield and Carrick you can see what he adds to the team. Bradley certainly hopes he will be back in action soon. He tweeted from hospital: “Thanks everyone, that’s football for you.